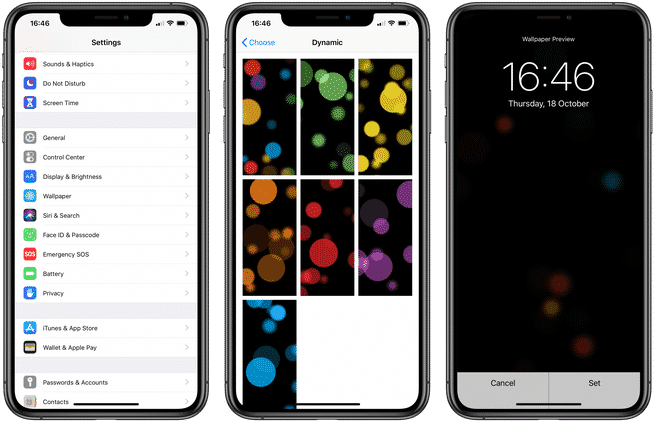 You can set a dynamic wallpaper on your iPhone or iPad. However, you must use the dynamic wallpapers created by Apple. You cannot create your own. Open Settings > Wallpaper > Choose a New Wallpaper. Tap on Dynamic and choose a dynamic wallpaper. At the bottom tap Set. Dynamic wallpapers move based on the movement of the device. And, OLED devices get dark backgrounds while LCD devices getting brighter, more vibrant backgrounds.